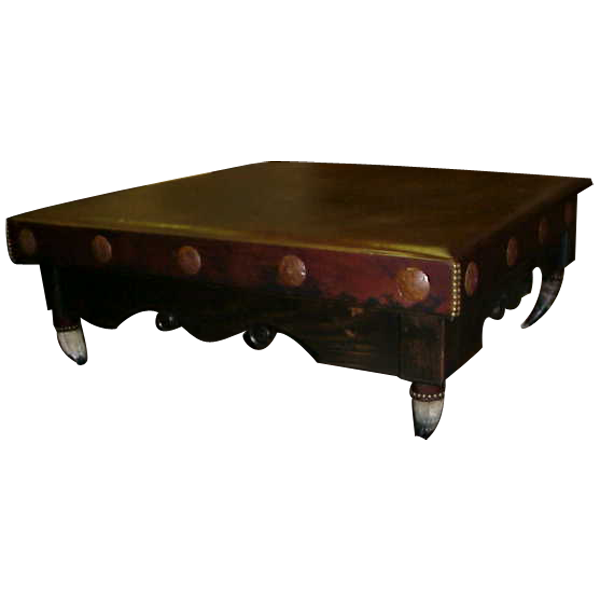 The entire top of this handcrafted, Western style coffee table is upholstered with customized, full grain leather. You can select the color and the texture of the leather upholstery that is appropriate for your home décor. The leather is hand tacked to the top with beautiful, gilt nails. Below the top is a solid wood base, and the sides of the upper base are adorned with large, hand forged, iron nails intermittently hand tacked to its sides. The lower base is adorned with a graceful, curved skirt, with scroll details. The coffee table rest on inwardly inverted, steer horn supports. It has an antique finish, and it is made with the best, sustainable, solid wood available. The coffee table is 100% customizable.